Perth Glory's defeat of Melbourne Victory has the Western Australians close to a first A-League minor premiership. 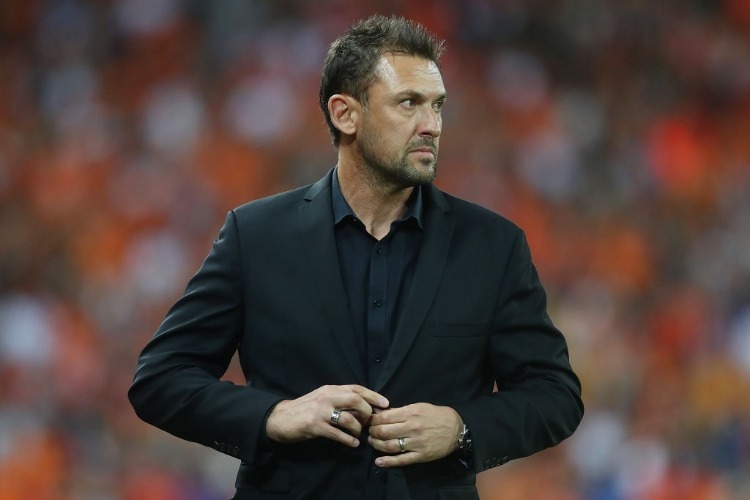 Perth Glory boss Tony Popovic is yet to claim the A-League minor premiership, and Melbourne Victory coach Kevin Muscat is yet to concede it. But with a seven-point gap between the top-ranked Glory and second-placed Victory, the contest certainly looks as good as over with just one-third of the season remaining. Glory flexed their muscles at AAMI Park on Sunday, looking every inch a well-oiled machine in a 2-1 defeat of the Victory. The goals were more than an hour in coming, but Popovic's side looked winners-in-waiting after finding their rhythm early even as the away team. Popovic agreed his side "deserved the three points" but wouldn't be drawn on his title prospects. "Of course we can (be caught). If you do the sums, it's quite easy," he said. "We're certainly delighted with the result. We'll enjoy the victory ... and we'll go home and try and do it all over again. "We'll see. We haven't spoke about (the title). "We're not going to go home and say 'look boys we're seven ahead'. One major difference between the two clubs has been player availability. While Perth has suffered few missing men, the door to Victory's treatment room has resembled a turnstile. The return of Keisuke Honda and Georg Niedermeier to starting roles could help Victory bridge the gap, although a second week missed by frontman Ola Toivonen appears bad news. "Ola got a knock a few weeks ago and he has not been able to remove the blood around the bone enough," Muscat explained. "The blood has calcified around the bone and it's just a waiting game for it to move and then get his full range." Other results this weekend went perfectly for Perth. The second, and likely only other, challenger to a Perth premiership, Sydney FC, also lost on the weekend, downed 2-1 unexpectedly by Brisbane Roar. Dylan Wenzel-Halls' last minute goal sealed the Roar's first win in nearly three months, leaving the Sky Blues eight off the premiership pace. No team has managed three-straight premierships and Sydney are now at long odds to do just that; though Steve Corica has the quality to keep up the fight. The Glory could also smile on the result between fourth and fifth place - a 1-1 draw between Adelaide United and Melbourne City, which featured a goal to returned Socceroo Jamie Maclaren on his City debut. Their draw keeps that duo at arm's length from not only the title race, but Asian Champions League qualification spots. Further down the ladder, Wellington Phoenix drew 1-1 with Newcastle Jets and Western Sydney ended a 10-match winless run by beating hapless Central Coast 2-0.